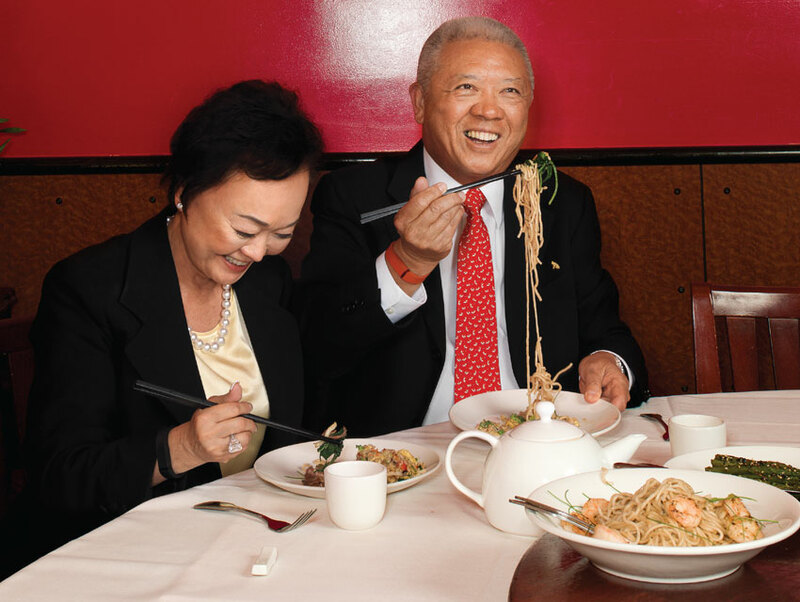 Peggy and Andrew Cherng, the co-CEOs of the Panda Restaurant Group, which also includes the Panda Inn in Pasadena. A Panda Express location had opened in Eagle Rock soon after my wife and I moved into the neighborhood, though it was at least a decade before I gave it a try. Chinese food can be wonderful, but in my experience grab-and-go Chinese food has been about dimly lit storefronts where exhausted owner-operators serve chicken chow mein or sweet-and-sour pork turned into mush and shoe leather after idling for too many hours in the warming trays. Of course parenthood has a way of drawing you into places you’ve resolved never to go. Driving home one evening, with my son wide awake well past his bedtime and not yet fed, I found myself pulling into the minimall at the bottom of our hill, where the backlit Panda Express mascot offered us a solution. “Welcome to Panda,” the nearest server shouted, smiling and making eye contact as we walked through the door. While I joined a long but rapidly moving line, Isaac pressed ahead, squeezing as best he could between mostly tolerant patrons to survey his options: sautéed chicken with string beans, beef with broccoli, and eggplant tofu. There were too many customers for the entrées to linger in their steam trays for more than a couple of minutes. The food was in perpetual motion, from wok to serving pan to two- or three-item plate. Neatly stacked bins of raw onions and bell peppers advertised their freshness. The table we settled at was immaculate, just as it would be within five minutes of our departure, despite the cascades of fried rice, chow mein, and stir-fried vegetables that fell from Isaac’s fork onto the floor. For Isaac, Panda Express became a destination on par with Disneyland. As we began eating more meals there, I got a sense of how the place functioned. The cooks, cashiers, and counter people always exuded energy and a sense of purpose. They appeared to be working toward something more than at something, and that something was our satisfaction. The clientele was heavy on teenagers, college students, and parents with a few kids in tow, but day laborers, elderly couples, and salespeople from the nearby cell phone outlet were also among the regulars. All took a certain delight in customizing their combo plates and having the world revolve around them, at least for a moment. Panda Express’s ethos, as well as its food, invited visitors to take things lightly, to relax and enjoy themselves. Friendliness, cleanliness, a can-do attitude so emphatic it stopped just short of hokey—together these qualities had created a no-frills oasis of belonging, and not just here in Eagle Rock but at hundreds of locations across Southern California and beyond. Who, I found myself wondering, was the driving force behind this quick-serve success story? Who had made this decision to focus more on personal interaction than on the harsh efficiencies that so often prevail at a quick-serve chain? And who had somehow taken one of the most fast-food-resistant cuisines and made it sing for less than seven bucks a heaping plate? Polishing off my eggplant tofu one evening, I decided to find out. With its balmy weather and superabundance of cars, Southern California has been the perfect spawning ground for America’s $191 billion fast-food industry. Of all the quick-serve concepts that blanket the globe, a remarkable number—including Taco Bell, Del Taco, Der Wienerschnitzel, and of course McDonald’s—were hatched on a SoCal street corner. So it should come as no surprise that the Chinese American restaurant that would lead to the Panda Express empire, Panda Inn, opened its doors in Pasadena in 1973. Historians of fast food will tell you that if a restaurant catches on, one of two scenarios will play out. In the first, the original idea proves bigger than the small-time entrepreneur who conceived it, and others with more ambition and managerial prowess turn it into a phenomenon. Such was the fate of the brothers who founded McDonald’s in San Bernardino in 1940: They sold their company in its relative infancy, and in so doing they set the stage for massive growth but also for an overdependence on cheap labor and cheaper ingredients (remember pink slime in your burger?). The other fast-food success story adheres to the In-N-Out script: The originators stay in control of not only the enterprise but every store, none of which is franchised. The company may experience only modest growth (In-N-Out has 300 stores), but it has a reputation for maintaining food quality and treating its workers well. Panda Express follows the latter course to a great degree (fresh ingredients, a tradition of honoring its employees with higher pay and better benefits, and no franchises in the United States), but here’s where it strays from In-N-Out’s script: It isn’t tiny. With nearly 1,800 outlets in the United States, Mexico, and Canada, the company achieved more than $2 billion in sales last year—three times In-N-Out’s. 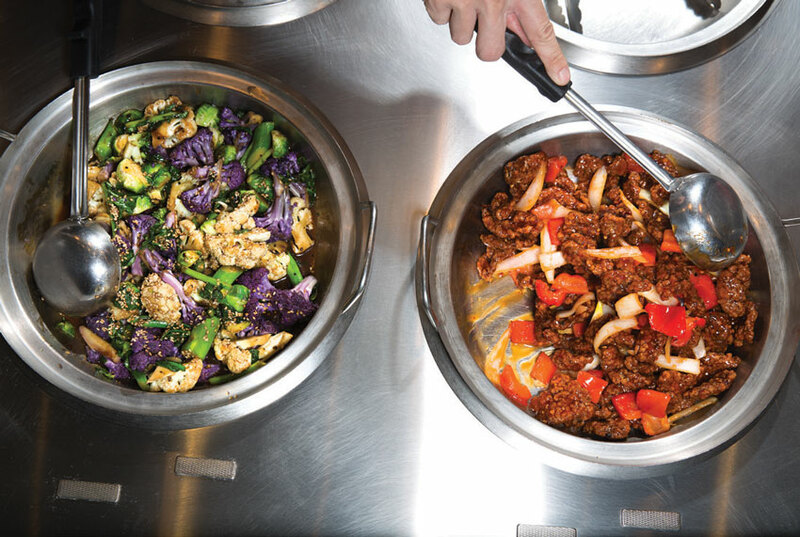 Headquartered in the San Gabriel Valley, the Panda Restaurant Group is solely owned by the family that launched it decades ago, and it is run by one of the most interesting power couples in the history of American restaurant chains. Andrew and Peggy Cherng came to the United States as Chinese immigrants in the mid-1960s. Together they pioneered what is now called “fast-casual” dining—still within the fast-food orbit but serving more wholesome fare than burger or taco giants do and charging a dollar or two more for a full meal. Today the Cherngs serve as co-CEOs of a company that essentially owns the Chinese-food sector of the quick-serve market. Their net worth is estimated at more than $3 billion. Cherng has a confident chin, a white crew cut that achieves a halo effect in the right light, and dark, expressive eyes that can let you know in a glance what a great job you’re doing or how much you still need to improve. His voice has a quiet intensity that demands you listen to him carefully. His office, with its expansive view of the San Gabriel Mountains, is larger than it is luxurious. A Magnavox CD player a few decades old serves as its sound system. The decor, if you can call it that, is a ragtag bunch of Buddhas and toy panda bears. If all this sounds a little heavy on the self-help jargon, there’s good reason. Seemingly every corner of Panda headquarters has been designed to promote employee growth. Along the corridors are motivational posters that urge workers to never stop striving for more—both for themselves and the company. On nearly every desk or bookshelf are copies of such best-selling guides to betterment as Stephen Covey’s The 7 Habits of Highly Effective People and Tony Robbins’s Re-Awaken the Giant Within. The company actively encourages its employees to join Toastmasters International and attend personal-improvement seminars as retro as Dale Carnegie Training and as New Agey as the Landmark Forum (which seems a likely source for Cherng’s integrity lingo). On Saturday mornings the grand auditorium fills with hundreds of employees, ranging from servers to members of the Panda Group’s PR and legal teams as well as many of their children. They gather together for inspiring speeches, team-building activities, and plenty of group hugs. If Andrew Cherng is Panda’s master motivator and maître d’, Peggy Cherng, 67, is its chief technician. A computer scientist who earned her Ph.D. in the early years of mainframes, she customized the operations system, financial tracking system, and supply-chain management system that have helped turned Panda Express into a transnational enterprise. She briefs me on the company’s “2020 Vision,” its blueprint for future growth.